(Bloomberg) -- FuelCell Energy Inc. has spent 50 years trying to take its low-pollution power plants mainstream. It’s running out of time. Just a decade ago, the Danbury, Connecticut-based company was chasing orders across the U.S., Asia and Europe. At its height in 2000, the company’s market value soared above $1.5 billion. South Korea’s largest steelmaker became the company’s biggest investor. Electricity giant NRG Energy Inc. took a big stake, too. Today, FuelCell has been reduced to a shell of the company it was -- all but crushed by the economics of solar and wind power and outgunned by rivals including Bloom Energy Corp. that offer more flexible and less bulky systems. Last year, its once-biggest investor -- the South Korean steelmaker Posco -- ended a decade-long relationship. FuelCell’s chief operating officer left last week. And on Monday, the company said it cut almost a third of its workforce to save $11.5 million in annual payroll expenses. With seemingly no savior waiting in the wings, FuelCell may struggle to stay afloat. The company posted a $62.2 million loss last year. It has $67 million in long-term debt, about $40 million in short-term borrowings and $27.8 million in cash and equivalents, according to the latest filings. Earlier this month, the company’s shareholders took the rare step of rejecting an executive compensation plan. FuelCell sank as much as 11 percent Tuesday to 25 cents per share. The stock is down 88 percent over the past year. The company, founded in 1969, produces small, modular power plants used by universities, on corporate campuses and elsewhere. While they consume natural gas, the systems produce power through a chemical reaction rather than combustion. So they emit fewer emissions than conventional gas plants. It’s chief among the company’s selling points. The technology, however, never really caught on. While the costs of manufacturing fuel cells have fallen, solar and wind farms have proven cheaper to build, with panel costs plummeting 68 percent in five years. Even against its own fuel cell rivals, FuelCell struggled. Customers have gravitated toward the more flexible generators sold by its competitors, according to Irwin. FuelCell meanwhile pointed to its new seven-year fuel cell stack design that allows for a longer life between major maintenance and a new high-efficiency fuel cell. Gelston also said the company has a backlog of more than 80 megawatts of projects yet to build. The biggest blow to FuelCell’s business by far was the loss of Posco as a benefactor. Together, they built the world’s biggest fuel-cell power plant. The steelmaker licensed the company’s technology with the idea of building and selling power plants throughout Asia. But after completing 150 megawatts of capacity, Posco began a review of its operations, citing lower demand and higher costs. NRG, the largest independent U.S. power producer, has also been a key backer. It owned 1.4 million shares in the company, based on the latest holding data compiled by Bloomberg, and provided a $40 million revolving credit facility to help FuelCell build power plants. 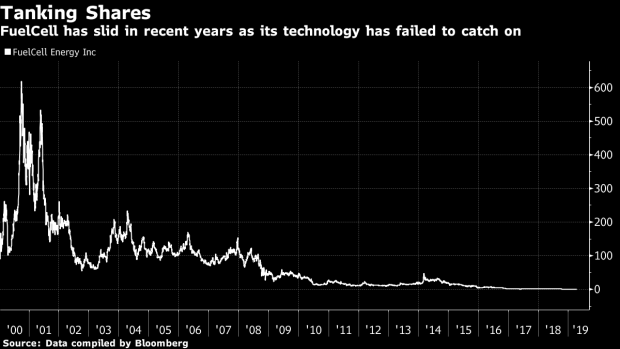 But that credit line may expire this year, and without another large investor willing to throw more money at the company’s technology, FuelCell faces a grim future, Irwin said.